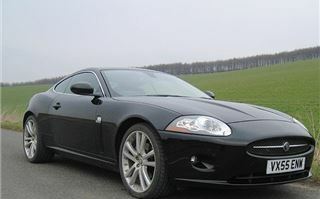 The new 2006 Jaguar XK is a much more Jaguar-like successor to the original 3.8 E-Type than the XJS or the outgoing XK. Fashion these days dictates bling wheels and sonorous sounds from exhaust pipes. That’s why we see Vectras with factory fitted nineteen inchers. And, as Terry Thomas once put it, we hear “sheer ruddy Tchaikovsky” coming out of the backs of everything from Golf R32s to the latest Mercedes SLs. The dishonourable exception is the Ferrari F430, which somehow contrives to sound both earpiercingly loud and awful. But you can’t beat a good V8. And until yesterday, to my ears at least, the unbeaten V8 was the wonderful new Audi RS4 hotdogging past the pits at Goodwood. Then there we were, on a miserably cold day in the Cotswolds, trying to take some snaps of the new XK8 we’d been driving, when another one snarled past. It didn’t growl like the SL500. It didn’t bark like the RS4. It snarled, at half song, waiting to pounce, warning everyone in the vicinity it had at least another 2,000rpm to go. As the commercial tells you, it’s gorgeous. A much more Jaguar-like successor to the original 3.8 E-Type than the XJS or the outgoing XK. It somehow manages to be both a beautiful grand touring cruiser and a real sportscar at the same time. And it isn’t going to rust. The entire body structure is aluminium, which also, surprisingly, makes it better in a crash than steel because aluminium absorbs 30% more energy. The more parts a body is made from the weaker it will be, so Jaguar uses 257 in the new aluminium XK roadster compared to 359 in the old one, and 2,762 joints compared to 5,189. So it’s stiffer, and safer if you hit something. As well as that, it’s lighter than a steel bodied car and thereby more agile. The coupe weights 1,595kg and the roadster 1,635kg, against the 1,845kg of a Mercedes SL500. Both have 300bhp against the SL500’s 388bhp. The SL500 is undeniably faster, getting to 60 in 5.1 seconds against the XK’s 6.0 seconds. 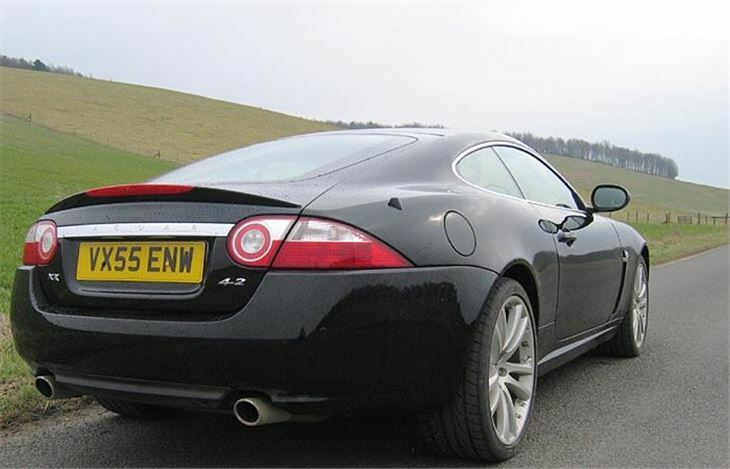 But it also gobbles up slightly more fuel, doing 23.2mpg combined against the XK’s 25mpg. And, at £75,880 it’s a cool £11,000 dearer. 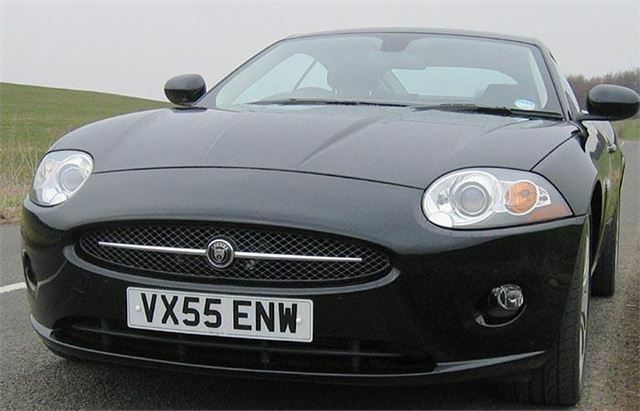 Probably better to compare the XK with the £62,885 SL350, which is 0.3 of a second slower to 60 yet at 27.4mpg combined a useful 2.4mpg more economical than the Jag. However, this is missing the point. Even though the Germans have made the SL350 much more of a sportscar than it was before, the XK8 was born a sportscar. It has the best Jekyll and Hyde paddle-shift automatic gearbox ever fitted to any car anywhere in the world. You can pootle along fully automatically, completely ignoring the paddles under your fingers. But if you suddenly need a lightening reaction, just tug the left a couple of times and you’ll get one. There is absolutely no delay or hesitation at all. The box drops a gear as soon as you pull the paddle. Then, once the emergency (or the fun) is over, it automatically reverts back to automatic. And as well as that, instead of an impossible-to-see LCD or an obscure LED you get a strip-type horizontal display right in front of your eyes listing all six gears and highlighting the one you’re using in red. They couldn’t have done it better. The car comes on standard 18” wheels with unique tyres that apparently few buyers ever order (which explains the old model’s 18” tyre shortage). You can also have it on 19” wheels with runflats (which frees up a lot more boot space). But no less than 69% go for the full bling-effect twenty-inch split-rims that look sensational, but don’t do the ride quality any favours. Common sense dictates 18” wheels. But fashion and residual values say 20” (or 19” with runflats if the lady has luggage). That’s the way it is. Mercedes SLs these days come quite well equipped. 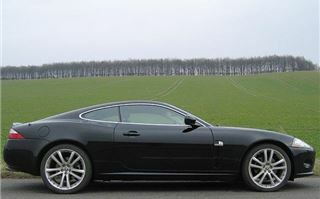 But the XK has the lot. Both coupe and convertible offer vestigial rear seats, with seatbelts, like those in a Porsche 911. 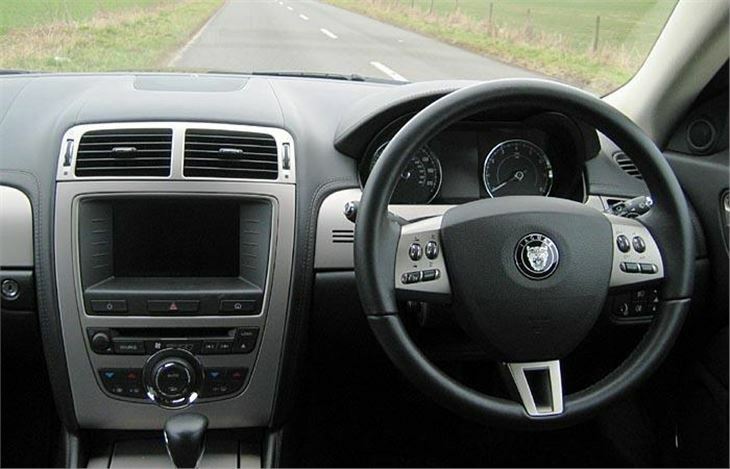 Touch-screen satnav is standard with a 7” colour screen. 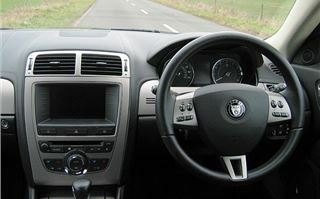 The Jaguar sound system includes a 4 x 25W amplifier, 6 speakers, a 6CD autochanger and an MP3 socket. There’s Bluetooth phone connectivity. Cruise control with Active Speed Limiter. Jaguar’s instant release electric parking brake. A pair of pop-up roll hoops. Rear park assist. And obviously ABS, EBA, EBD and DSC, which read like a row of medals but you know what they mean. So which will it be? The XK or the SL? There’s no doubt which is the more beautiful. The Jaguar also has a much faster shifting transmission. But it doesn’t have an electric folding hardtop. And it isn’t that vital thing among the status conscious. It isn’t a Mercedes. If it were a man’s world the dilemma would be like choosing between a stunningly beautiful, lithe, athletic English Rose, or a merely beautiful, successful German fashion model. Lady Isabella Hervey v/s Heidi Klum, if you like. However, it isn’t merely a man’s world. I guess it works out like this: You buy an SL500, you’re rich. You buy an SL350, you’re a status seeker. 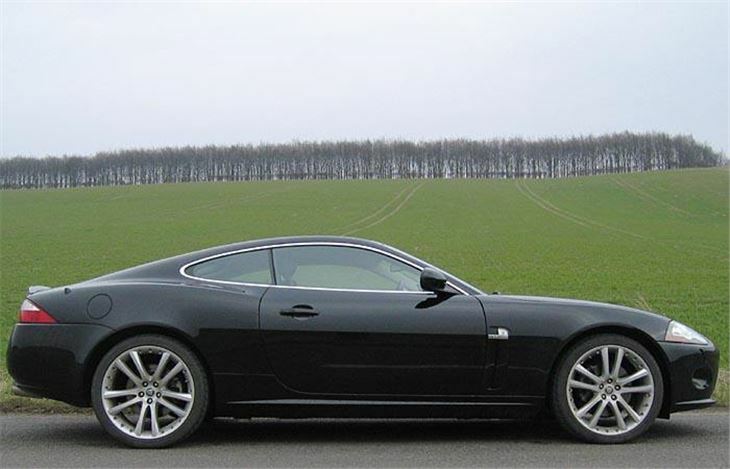 You buy an XK8, even on 20” wheels, you’re cool.